Thank you for all of your supportive comments and emails. I heart y’all. It is hard not to get into a funk when my father comes around. I try to rise above the funk, but it doesn’t always work. So, to try and keep positive I shall share with you a few things I’m loving right now (besides you). Kanye West and his new song Love Lockdown. I adore him. I think he’s incredibly talented. He’s always coming out with something new and different. He is also very funny without trying to be. The video is awesome too. Very clean asthethically. He was on Ellen and showed the video this week. Basic Instinct by Pure Romance. It’s this tiny little bottle of roll on cologne. They say it’s unisex but I doubt CSP would let me put any on him. It smells SO good. And it smells different on every person. So who knows what it would smell like on you? I loooove it. And I didn’t expect to. And isn’t that a cool surprise when stuff like that happens? It’s a little pricey for such a teeny bottle but you don’t use but a drop so it lasts a good while. Body Dew by Pure Romance. It’s this spray on body oil that is most effective just after your shower, while you’re still wet. It is doing wonders for my excema. It smells great, makes your skin so soft without being greasy, and gives it a, well, dewy look. Love On The Inside by Sugarland. 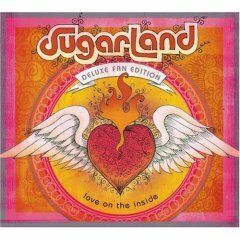 Love Sugarland. Wonder how his wife feels about him being around cutie Jennifer all the time. Favorite songs on this album: Fall Into Me, Steve Earle (minus the talky part), Come On Get Higher, Genevieve, Already Gone. Great album for a road trip. Also think cover art would make a great tattoo! Hocus Pocus candles by PartyLite. My favorite October candle. When I unpacked all my Halloween decorations I was so excited to unpack these candles and get them lit. When they burn the liquid wax melts into this super cool yellowy neony green color. And they smell so good!